Topical application of calendula facilitates wound healing, and may reduce painful swelling and irritation associated with radiation therapy. It has not been shown to treat cancer. Naturally occurring chemicals derived from the marigold plant have been shown to reduce inflammation in laboratory studies. These chemicals, which are called triterpenoids, also inhibit HIV virus and some tumors. When applied to the skin, extracts of calendula help to heal wounds and inflammation after radiation therapy. More research is needed. Laboratory and animal studies show that calendula, when applied to the skin, has anti-inflammatory properties, and reduces burn tissue injury in animals. However, studies have not been undertaken to determine if this corresponds to faster healing of burns and scalds. Also, clinical studies in humans have not been performed. Evidence is lacking to support this claim. Calendula ointment applied to the skin reduced painful swelling and irritation associated with radiation therapy in breast cancer patients. You are allergic to plants in the Asteraceae/Compositae family. You are pregnant or lactating because safety data are lacking. Calendula can cause allergic reactions. Derived from the flower of the marigold plant, calendula is used topically for wound healing (1). Major constituents of the leaves and stems include lutein and beta-carotene (2). Calendula extracts demonstrated anti-inflammatory properties (3) that may improve wound healing (4); and antibacterial, anti-parasitic (5), anti-HIV (6), cytotoxic and anti-tumor effects (9) (10) both in vitro and in vivo. Studies in murine models reported hepato-, reno- (14) (22), photo- (15), and cardioprotective (16) properties. An herbal formulation containing calendula was found effective in reducing earache in children with acute otitis media (7) (8); and a topical application of a calendula cream was found to be safe and effective in infants for treating diaper dermatitis (21). Preliminary data also support the use of topical calendula for prophylaxis of acute dermatitis during radiation therapy (11) (13); for the treatment of diabetic foot (23) and venous leg (24) ulcers; and for treating vaginal candidiasis (25). A mouthwash containing calendula was shown useful for reducing dental plaque and gingivitis adjunctive to scaling (25), for reducing chemotherapy-induced stomatitis (17), but was ineffective in preventing mucositis associated with chemo-radiotherapy (26). Larger studies are needed to confirm these observations. Triterpenoids present in calendula have anti-inflammatory (3) and anti-HIV (6) effects, and a calendula extract suppressed cell fusion, which may inhibit early events in the HIV replication cycle (6). Calendula also has hepato- and reno-protective properties, that are likely due to its antioxidant activity (14). The photoprotective effect of topical gel formulations is thought to be associated with an improvement in collagen synthesis in the sub-epidermal connective tissue (15). In addition, calendula affords cardioprotection that involves modulating the antioxidant and anti-inflammatory pathways by activation of Akt (a serine/threonine protein kinase) and Bcl2 (a protein that regulates apoptosis), and down regulation of tumor necrosis factor (TNF alpha) (16). Calendula was also shown to inhibit human gingival fibroblast-mediated degradation of collagen and matrix metalloprotease (MMP-2) activity (18). Essential oil derived from its flowers showed sun-protective activity (19), and prevented UVB-induced alterations in the skin (20). In addition, calendula accelerated healing of experimentally-induced thermal burns by increasing collagen-hydroxyproline and hexosamine, two bio-indicators of wound healing (4). It may also help reduce inflammatory bone resorption in experimental periodontitis, likely mediated via its anti-inflammatory property (27). Calendula should be avoided during pregnancy and lactation because safety data are lacking (1). Calendula is known to cause allergic reactions (12). Barnes J, Anderson LA, Phillipson JD. Herbal Medicines. London: Pharmaceutical Press; 2002. Akihisa T, Yasukawa K, Oinuma H, et al. Triterpene alcohols from the flowers of compositae and their anti-inflammatory effects. Phytochemistry. Dec 1996;43(6):1255-1260. Chandran PK, Kuttan R. Effect of Calendula officinalis Flower Extract on Acute Phase Proteins, Antioxidant Defense Mechanism and Granuloma Formation During Thermal Burns. J Clin Biochem Nutr. Sep 2008;43(2):58-64. Kalvatchev Z, Walder R, Garzaro D. Anti-HIV activity of extracts from Calendula officinalis flowers. Biomed Pharmacother. 1997;51(4):176-180. Sarrell EM, Cohen HA, Kahan E. Naturopathic treatment for ear pain in children. Pediatrics. May 2003;111(5 Pt 1):e574-579. Sarrell EM, Mandelberg A, Cohen HA.Efficacy of naturopathic extracts in the management of ear pain associated with acute otitis media. Arch Pediatr Adolesc Med. Jul 2001;155(7):796-799. Boucaud-Maitre Y, Algernon O, Raynaud J. Cytotoxic and antitumoral activity of Calendula officinalis extracts. Pharmazie. Mar 1988;43(3):220-221. Ukiya M, Akihisa T, Yasukawa K, et al. Anti-inflammatory, anti-tumor-promoting, and cytotoxic activities of constituents of marigold (Calendula officinalis) flowers. J Nat Prod. Dec 2006;69(12):1692-1696. Pommier P, Gomez F, Sunyach MP, et al. Phase III randomized trial of Calendula officinalis compared with trolamine for the prevention of acute dermatitis during irradiation for breast cancer. J Clin Oncol. Apr 15 2004;22(8):1447-1453. Reider N, Komericki P, Hausen BM, et al. 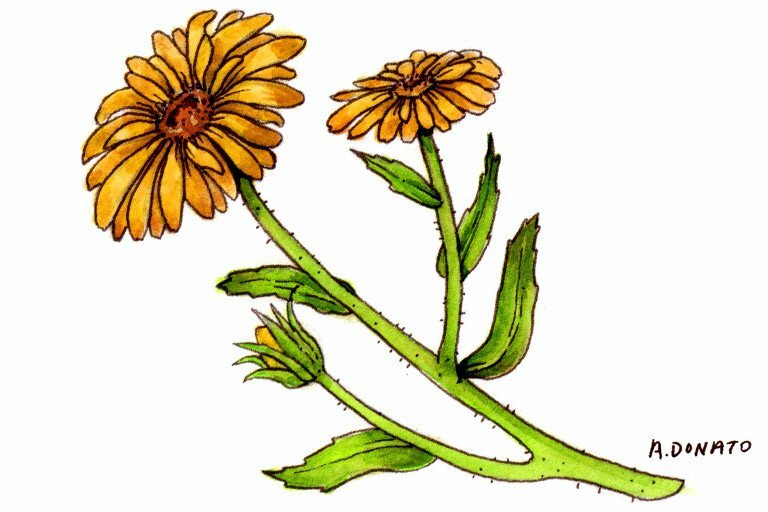 The seamy side of natural medicines: contact sensitization to arnica (Arnica montana L.) and marigold (Calendula officinalis L.). Contact Dermatitis. 2001 Nov;45(5):269-72. Kassab S, Cummings M, Berkovitz S, et al. Homeopathic medicines for adverse effects of cancer treatments. Cochrane Database Syst Rev. 2009 Apr 15;(2):CD004845. Review. Preethi KC, Kuttan R. Hepato and reno protective action of Calendula officinalis L. flower extract. Indian J Exp Biol. 2009 Mar;47(3):163-8. Fonseca YM, Catini CD, Vicentini FT, et al. Efficacy of marigold extract-loaded formulations against UV-induced oxidative stress. J Pharm Sci. 2011 Jun;100(6):2182-93. Ray D, Mukherjee S, Falchi M, Bertelli A, Das DK. Amelioration of myocardial ischemic reperfusion injury with Calendula officinalis. Curr Pharm Biotechnol. 2010 Dec;11(8):849-54. Oberbaum M, Yaniv I, Ben-Gal Y, et al. A randomized, controlled clinical trial of the homeopathic medication TRAUMEEL S in the treatment of chemotherapy-induced stomatitis in children undergoing stem cell transplantation. Cancer. 2001 Aug 1;92(3):684-90. Saini P, Al-Shibani N, Sun J, et al. Effects of Calendula officinalis on human gingival fibroblasts. Homeopathy. 2012 Apr;101(2):92-8. Mishra A, Mishra A, Chattopadhyay P. Assessment of In vitro Sun Protection Factor of Calendula Officinalis L. (Asteraceae) Essential Oil Formulation. J Young Pharm. 2012 Jan;4(1):17-21. Mishra AK, Mishra A, Verma A, Chattopadhyay P. Effects of Calendula Essential Oil-Based Cream on Biochemical Parameters of Skin of Albino Rats against Ultraviolet B Radiation. Sci Pharm. 2012 Sep;80(3):669-83. Verma PK, Raina R, Sultana M, Singh M, Kumar P. Total antioxidant and oxidant status of plasma and renal tissue of cisplatin-induced nephrotoxic rats: protection by floral extracts of Calendula officinalis Linn. Ren Fail. 2016;38(1):142-50. Buzzi M, de Freitas F, Winter M. A Prospective, Descriptive Study to Assess the Clinical Benefits of Using Calendula officinalis Hydroglycolic Extract for the Topical Treatment of Diabetic Foot Ulcers. Ostomy Wound Manage. 2016 Mar;62(3):8-24. Buzzi M, de Freitas F, de Barros Winter M. Therapeutic effectiveness of a Calendula officinalis extract in venous leg ulcer healing. J Wound Care. 2016 Dec 2;25(12):732-739. Khairnar MS, Pawar B, Marawar PP, Mani A. Evaluation of Calendula officinalis as an anti-plaque and anti-gingivitis agent. J Indian Soc Periodontol. 2013 Nov;17(6):741-7. Saffari E, Mohammad-Alizadeh-Charandabi S, Adibpour M, Mirghafourvand M, Javadzadeh Y. Comparing the effects of Calendula officinalis and clotrimazole on vaginal Candidiasis: A randomized controlled trial. Women Health. 2017 Nov-Dec;57(10):1145-1160. Marucci L, Farneti A, Di Ridolfi P, et al. Double-blind randomized phase III study comparing a mixture of natural agents versus placebo in the prevention of acute mucositis during chemoradiotherapy for head and neck cancer. Head Neck. 2017 Sep;39(9):1761-1769. Alexandre JTM, Sousa LHT, Lisboa MRP, et al. Anti-inflammatory and antiresorptive effects of Calendula officinalis on inflammatory bone loss in rats. Clin Oral Investig. 2018 Jul;22(6):2175-2185.